Franisco Jose Mejía...married to Sorivel and the couple has a son, Francisco Miguel, and a daughter, Sorianny... studied at Las Carreras de Bani...idolizes Robinson Canó and Manny Ramirez. Split the season between Columbus (AAA), El Paso (AAA), CLE and SD...acquired by SD from CLE on 7/19 in exchange for LHP Brad Hand and RHP Adam Cimber...Began the season with Columbus (AAA) and appeared in 79 games, making 40 starts at catcher, 19 in LF and five in RF… slashed .279/.328/.426 with 22 doubles, seven HR, 45 RBI and 32 runs scored...Earned International League Mid-Season All-Star honors and was named IL Player of the Week on 7/1...Selected to the World roster for the SiriusXM All-Star Futures game for the third consecutive year...Recalled by CLE on 7/14 and went 0-for-2 with two walks as the DH that same day vs. NYY before being optioned to Columbus the next day...Acquired by SD on 7/19 and optioned to ELP…made 26 starts at catcher for the Chihuahuas and slashed .328/.364/.582, hitting safely in 24 of his 31 games played...Hit safely in 15 of his last 17 games with ELP from 8/12-9/3, slashing .356/.368/.712 with six doubles, one triple, six HR, 18 RBI and 16 runs scored...Recalled by SD on 9/4 and made 10 starts behind the dish and one as the DH, slashing .185/.241/.389 with a 1.000 fielding percentage (no errors in 107 total chances)...Hit his first two career ML home runs on 9/6 at CIN, becoming the first Padre to ever hit a home run in his first two at-bats in his first start with SD...he became the second Padre in club history to homer in two of his first three at-bats with the team (also: Seth Smith, two HR in 2014)…in the last 10 years, he's one of just four players to homer in each of his first two at-bats in his first start with a team (PHI Daniel Nova in 2017, CLE George Kottaras in 2014 and DET Jhonny Peralta in 2010)...Slashed .163/.226/.265 over his remaining 18 games with 17 SO against three BB.. Hit a walk-off grand slam in the bottom of the ninth inning on 9/16 vs. TEX, becoming the second rookie in Padre history to ever hit a walk-off GS (first: Everth Cabrera on 8/9/09 vs. NYM) and the seventh Padre overall to ever hit a walk-off GS (last: Derek Norris on 5/29/15 vs. PIT)...the only other rookie to hit a walk-off GS in 2018 was CHC's David Bote on 8/12 vs. WSH...Following the season, played in 19 games for the Dominican Winter League champion Estrellas de Oriente, their first championship in more than half a century...Entered 2019 rated as the No. 26 overall prospect by MLB Pipeline, No .29 by ESPN.com and No. 32 by Baseball America...Among prospect rankings in the Padres system entering 2019, he was rated No. 3 by ESPN.com and No. 4 by Baseball America and MLB Pipeline...Also entered 2019 rated as the No. 2 catching prospect overall by MLB Pipeline and No. 3 by Baseball America. Had another productive season in his development, spending the year at Double A Akron and was named an Eastern League Midseason and Postseason All-Star and was named E.L. Rookie of the Year in his first year at that level...Hit .297 (103/347) at Akron with 21 doubles, 2 triples, 14 home runs, 52 RBIs, 52 runs scored and 7 steals...He finished 6th in the league batting average, 8th in slugging pct (.490) and OPS (.835)... Led E.L. catchers in assists and threw out 30% (18/60) of potential basestealers...Hit .352 (32/91) off left-handed pitching and .299 (29/97) with runners in scoring position... Had 33 hits over an 18-game span, May 26-June 17...Hit .361 (30/83) in June with 18 R, 6HR & 19 RBI in 22 games. Recalled to Cleveland for the first time in his career on September 1 and made his debut in the night game of a doubleheader that night as a pinch-hitter...Made his first defensive appearance at catcher on Sept. 3 and started at DH at Chicago-AL on Sept. 4...Overall made 3 appearances at catcher, was 1-for-7 as a pinch-hitter and collected his first hit on Sept. 4 at Chicago-AL, a single off James Shields (his lone start at DH in September)...Named an MiLB.com organization All-Star (C) and was named to the Baseball America Postseason Double-A All-Star team. Hit a combined .342 (139-407) in 2016 with 63 runs, 29 doubles, 4 triples, 11 home runs and 80 RBI between Class A Lake County and A Lynchburg (.382/.514/.896)... He led all Indians Minor League hitters in average and OPS (.896) and ranked fifth in RBI and hits...His overall .342 batting average was also fifth-highest in all of Minor League Baseball in 2016 (min. 400 plate apps)...The Bani, Dominican Republic native hit in 50 consecutive games from May 27-August 13, the longest hitting streak in the Minors in 62 years and tied for fourth longest in Minor League history... He was named an organizational allstar and the 84th-overall MiLB prospect by MLB.com and enters 2017 as the top organizational prospect and best hitter for average in the system according to Baseball America... Hit .333 (92-276) vs. RHP for the year with 19 2B, 3 3B, 7 HR, 47 RBI and .359 (47-131) vs. left-handed pitching with 10 2B, 1 3B, 4 HR & 33 RBI (.932 OPS)...Hit .419 (39-93) in June with 7 2B, 6 HR and 22 RBI in 23 games on his way to Topps June Player of the Month honors... Appeared in 9 games for Estrellas in the DWL after the season. The Indians seventh-best prospect, ninth-best prospect in the New York-Penn League (Baseball America), started 52 games at catcher for the Scrappers, batting .319 (23-72) with RISP, hitting 6 doubles, 2 triples, 1 homer and 33 RBI...Mejia led Mahoning Valley in hits (70), triples (4) and total bases (101). Signed as a non-drafted free agent in July, 18-year-old Mejia led the AZL Tribe in batting, wrapping up the season with a .305 average (32-105), 9 doubles, a triple, 4 homers, 24 RBI and a .872 OPS (.348 OBP/.524 SLG). January 2, 2019 Estrellas Orientales placed C Francisco Mejia on the reserve list. November 13, 2018 C Francisco Mejia assigned to Estrellas Orientales. September 4, 2018 San Diego Padres recalled C Francisco Mejia from El Paso Chihuahuas. July 20, 2018 C Francisco Mejia assigned to El Paso Chihuahuas. July 19, 2018 San Diego Padres traded LHP Brad Hand and RHP Adam Cimber to Cleveland Indians for C Francisco Mejia. July 15, 2018 Cleveland Indians optioned C Francisco Mejia to Columbus Clippers. July 14, 2018 Cleveland Indians recalled Francisco Mejia from Columbus Clippers. June 12, 2018 Cleveland Indians optioned C Francisco Mejia to Columbus Clippers. June 11, 2018 Cleveland Indians recalled Francisco Mejia from Columbus Clippers. March 12, 2018 Cleveland Indians optioned C Francisco Mejia to Columbus Clippers. October 12, 2017 Cleveland Indians activated C Francisco Mejia. October 5, 2017 Cleveland Indians reassigned C Francisco Mejia to the minor leagues. September 1, 2017 Cleveland Indians recalled C Francisco Mejia from Columbus Clippers. August 31, 2017 C Francisco Mejia assigned to Columbus Clippers from Akron RubberDucks. July 14, 2017 Akron RubberDucks activated C Francisco Mejia from the temporarily inactive list. July 8, 2017 Akron RubberDucks placed C Francisco Mejia on the temporarily inactive list. May 20, 2017 Akron RubberDucks activated C Francisco Mejia from the 7-day disabled list. May 13, 2017 C Francisco Mejia assigned to Akron RubberDucks. May 12, 2017 Akron RubberDucks placed C Francisco Mejia on the 7-day disabled list. March 15, 2017 Cleveland Indians optioned C Francisco Mejia to Akron RubberDucks. November 18, 2016 Cleveland Indians selected the contract of Francisco Mejia from Lynchburg Hillcats. July 13, 2016 Lynchburg Hillcats activated C Francisco Mejia from the temporarily inactive list. July 9, 2016 Lynchburg Hillcats placed C Francisco Mejia on the temporarily inactive list. June 27, 2016 C Francisco Mejia assigned to Lynchburg Hillcats from Lake County Captains. March 24, 2016 C Francisco Mejia assigned to Cleveland Indians. 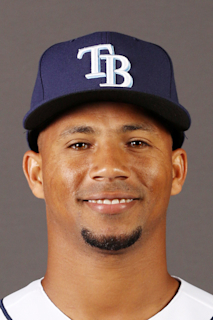 October 16, 2015 C Francisco Mejia assigned to Estrellas de Oriente. April 6, 2015 C Francisco Mejia assigned to Lake County Captains from Mahoning Valley Scrappers. June 11, 2014 C Francisco Mejia assigned to Mahoning Valley Scrappers from AZL Indians. June 20, 2013 C Francisco Mejia assigned to AZL Indians. July 2, 2012 Cleveland Indians signed free agent C Francisco Mejia to a minor league contract.